Consist of three different zones for maximum dirt trapping action. Great long lasting appearance with excellent water retention, soil and crush resistance. Zone 1 - Removes heavy duty dirt and debris. Zone 2 - Alternating stripes combine scraping and drying following the flow of traffic. Zone 3 - Premium drying. 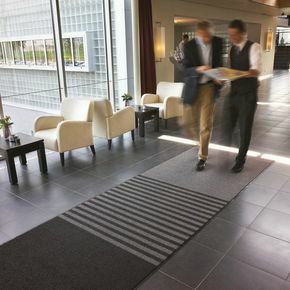 Having a mat at the entrance of your workplace which works effectively to trap dirt from footwear is ideal, as it helps to keep your workplace clean. Our triple zone entrance mats are a great choice, consisting of three different zones for maximum dirt trapping action. Zone 1 on the matting removes heavy duty dirt and debris from footwear. Zone 2 has alternating strips which combine scraping and drying, following the flow of traffic. Finally zone 3 offers premium drying, helping to prevent slip hazards on your workplace floor. These mats have a great long lasting appearance with excellent water retention, soil and crush resistance. They are available in two sizes - W x L mm; 910 x 3100 or 1200 x 3660 and they come in a charcoal/grey colour. Our triple zone entrance mats offer a great solution to keeping a workplace floor clean thanks to the three zones which provide a great way to remove dirt from footwear. They come with a 12 month guarantee and FREE UK Delivery.